Geek Lit Etc. : Manga Monday: When an Abnormal isn't Abnormal after all. Manga Monday: When an Abnormal isn't Abnormal after all. Armin has a stunning revelation, and Eren continues to learn to work as part of a group in Attack on Titan Volume 6. Note: Attack on Titan Volume 6 is part of an ongoing series. Check out the review for Volume 1 here, and Volume 5 here. Otherwise, read on! The Survey Corps is being hunted. While regular Titans are bad enough, and Abnormals are even more dangerous and unpredictable, these soldiers would gladly prefer them. Instead, they're being stalked by the Female Titan, and there's something wrong with her. Titans attack humans to eat them. They don't hunt them for fun, they don't leave dead humans on the ground, and they don't defend themselves. Their only goal seems to eat humans, even though as far as anyone can tell they don't actually require sustenance as such. The Female Titan is different. She isn't just grabbing for whatever human is closest. In fact, the only time she's killing humans is to defend herself. She's...horrifyingly creative about it too. And when she's attacked, she's careful to keep a hand over her weak point on the back on the neck. But the strangest thing she's done is when she came up on Armin. Instead of either ignoring or killing him, she actually pulled down his hood, as if to check who he was, and then ran on. She made the active decision not to kill Armin. 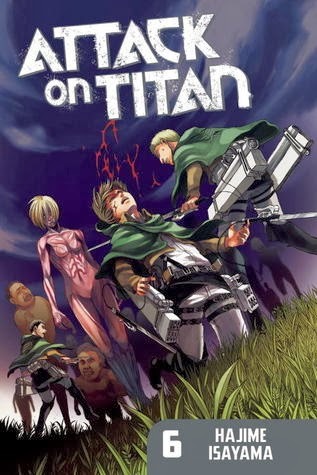 There's only one way to explain this: she, like Eren, is a human inside a Titan's body. Elsewhere in the Survey Corps, Eren is having a hard time of working in a group. He feels the death of each of his squadmates deeply, and wants to do anything he can to prevent them. He's not the leader of the squad, though, and he absolutely must listen to his superiors. Will Eren learn this hard lesson before he jeopardizes the entire mission? As Isayama splits the party, Attack on Titan has several storylines going at once. Each of our original three characters has plenty going on himself, as well as new characters like Levi. So far, he's masterfully balanced each of these threads, checking in on each character in turn as the plot demands. Each volume is another brief look into a terrible, post-apocalyptic world full of horrors, and this reader can't wait to see where it all ends up. Highs: Watching Eren's interaction with his new squadmates shows how well Isayama understands peoples' interactions with each other under stress. Lows: Not nearly enough Mikasa in this one. Verdict: A huge ending scene makes the wait for the next volume even worse than normal.